Fred Noonan Signed First Flight Cover, Navigator To Amelia Earhart. Frederick Joseph "Fred" Noonan (1893-1938 declared dead), was an American flight navigator and aviation pioneer who first charted many commercial airline routes across the Pacific Ocean during the 1930s. Famed aviator Amelia Earhart chose him as her navigator for their attempted pioneering round-the-world flight when they disappeared somewhere over the Central Pacific Ocean during one of the last legs of the flight. Offered is a First Flight cover from San Francisco to Manila, November 22, 1935, signed by all three crew members involved including Fred Noonan signed as F. J Noonan. 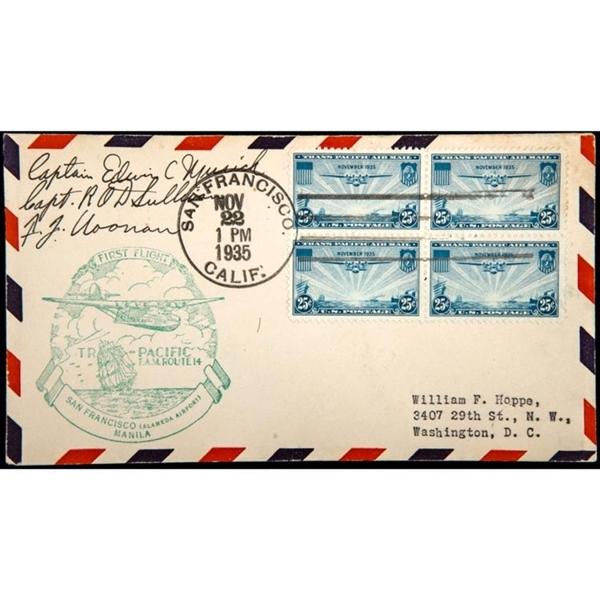 In beautifully archived condition THE FIRST TRANSPACIFIC MAIL FLIGHT. A date always to be regarded as a major landmark in the history of aviation is November 22, 1935, when Pam Am’s Martin M-130 Flying Boat christened “The China Clipper” left San Francisco, California. It carried a load of mail and arrived in Manila, Philippines, seven days later. This marked the culmination of over five years of extensive research and preparation. Captain Edwin C. Musick served as its pilot. The U.S. Postal Service issued a special stamp known as the Transpacific Air Mail Stamp in 25c denomination.